Built by Kempe Gowda (cheiftain of Vijayanagar Empire) in 15th century, Bangalore Fort was initially a “Mud Fort”. Later in 17th century it was renovated as Stone Fort by Hyder Ali. 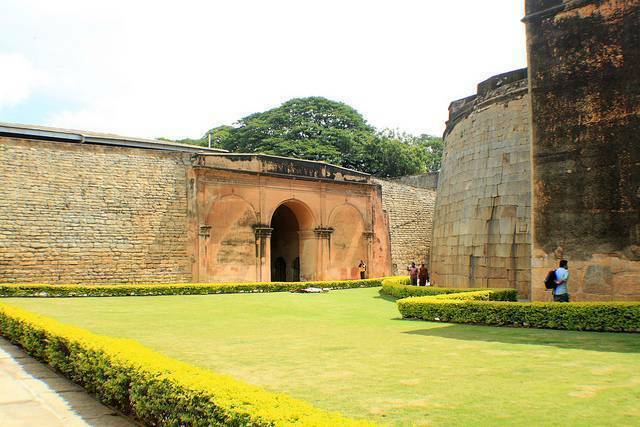 As per historical facts, Bangalore Fort had nine massive Gates. Among which the only remnant is the Delhi Gate. The fort acted as refuge for many people on endangered periods and attacks by enemy clan. A huge area within the Fort was termed as “Pettah”. The Pettah which once spread across several miles area was wrapped up by ramparts, barracks and small ditches. Currently the only witness for the Bangalore Fort is the Delhi Gate and two bastions. Major parts of fort were demolished in British attacks and worn out throughout the time period. Entry is free to the fort and open during day hours. Its more of a small bastion then a fort but well maintained monument.